Qualla Village Home located in Connestee Falls. 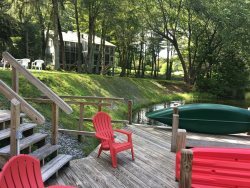 Sleeps 7, 4 bed / 2 full & 2.5 Bath, Qualla Village in Connestee Falls, Spacious! Lovely two story home is located in the Qualla Village inside Connestee Falls gated community. 20 minutes to downtown Brevard. It is also an hour from south-west of downtown Asheville, 45 minutes to Asheville Regional airport. This updated home is large and spacious, with all the amenities you will need for your vacation stay. The ground level floor includes the Kitchen, which peers into the living room, while the dining room and living room are one grand room. From the living room is the master bedroom that includes a king size bed, large walk in closet and a master bathroom with walk in shower. This floor also includes a half bath for guests’ convenience. Downstairs includes 3 bedrooms. One room has a king size bed, another has two twin beds and the last one has a single twin size bed. This level also includes a family room and one and half bathrooms. There is plenty of space, all in a beautifully modern style home. Jana was great to work with from beginning of our stay to the end. The ease of Checking in and Checking out was great. A little about the area: So few places in Western North Carolina mountains offer so many natural wonders and recreational amenities as does Connestee Falls. Connestee Falls feels like a private club community inside a state park. It’s a place of friendly people and breathtaking beauty featuring signature waterfalls, mountain lakes, championship golf, a grand clubhouse with dining, extensive hiking trails, pool, tennis & pickleball courts, a wellness center, and a wide variety of resident clubs. Connestee Falls is ideally located within easy reach of some of the best natural wonders in Western North Carolina. For starters, the community has enough of its own natural amenities to rival some state parks. There are several waterfalls including our signature Connestee Falls, four mountain lakes, over 14+ miles of hiking trails and parks for guests to explore and enjoy. Outside the gates, over a third of Transylvania County is part of Pisgah National Forest. Mountain views and another breathtaking vista are always just around the next bend. Nature and natural amenities can be found in any direction you venture from Connestee Falls and Brevard. DuPont State Forest, Gorges State Park, Table Rock State Park, Caesars Head State Park and many other nature attractions are nearby. The region has hundreds of waterfalls including the incredible Triple Falls in Dupont State Forest, site of the hit movie The Hunger Games. Head north of Brevard on Highway 276 to the Blue Ridge Parkway to find even more North Carolina Mountain attractions. Take Highway 64 west 30 miles to Sapphire Valley Resort and some of North Carolina’s best snow ski slopes. Continue another few miles to the popular mountain town of Cashiers.The Pisgah National Forest is a land of mile-high peaks, cascading waterfalls, and heavily forested slopes. Comprised of over 500,000 acres, the Pisgah is primarily a hardwood forest with whitewater rivers, waterfalls and hundreds of miles of trails. The area is home of not just Pisgah National Forest but also DuPont State Park and Gorges State Park. If you are an outdoors person you will love the scenic views, mountain trails and the waterfalls. You will be just minutes from America’s favorite scenic byway, The Blue Ridge Parkway, biking, hiking, white water rafting, rock climbing, kayaking, canoeing, zip lining, Segway tour…just about any outdoor activity! Or, take a quick ride to downtown Asheville to enjoy the first-rate restaurants, shopping, galleries, and entertainment. Discover Downtown Brevard Experience the home town feeling in downtown Brevard. As a vibrant hub for the arts, the downtown is also the crossroads to exceptional outdoor recreation, connecting to national and state forests. Home to the white squirrel, the downtown is host to several annual festivals and special events (including the White Squirrel Music Festival, the Squirrel Box Derby, and the Old Time Music Competition). Catch the hometown spirit and visit Brevard and the Land of the Waterfalls, Transylvania County. We also have great neighbors! Take a day to explore neighboring towns of Asheville, Hendersonville and Lake Toxaway. Each have different sites and sounds for people of all ages to enjoy. Asheville is a more colorful venture while Hendersonville is rich with history. Lake Toxaway is just as scenic as Brevard! All towns are less than an hour away from Brevard and your vacation rental.